The Alaska Rabbit was the brain child of Max Gotha, a German rabbit judge, and another, second German rabbit breeder. The goal was to create a rabbit resembling the Alaskan Fox for the fur trade, and to that end, their breeding program began in 1900. The initial plan for the new breed was to end up with a silvered black rabbit - a black animal with very long white guard hairs. 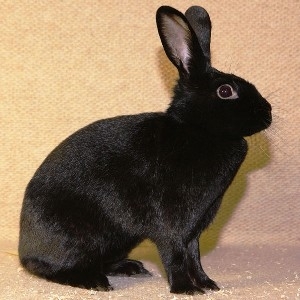 For unknown reasons, the breeders were satisfied in the end with the Alaska as it is known today - an intensely black rabbit with long glossy guard hairs that are black as night - without silvering. The BRC classifies the Alaska as a FUR rabbit. Its jet black fur is dense, silky and lustrous, glossy and intensely pigmented. Black is the only variety. It is a ‘self’ rabbit, the belly being a matte black. Its body type can be described as thickset and well rounded, blocky and solid. They weigh in at 7-9 lb (3.17 - 4.07 kg) - a medium sized rabbit. Find the Breed Standard of excellence at the British Rabbit Council. The breed was first shown in 1907 in Europe, making their way decades later to America via Holland and Canada. The American Rabbit Breeders Association (ARBA) recognized the breed in the mid-1970’s. The recognition was short-lived however. In 1980, the ARBA recognized Black Havana rabbits, a death-knell to the Alaska, at least in the USA. Apparently interest in the Alaska dropped sharply for in 1981, it was dropped from the ARBA. We do not know if any Alaska Rabbits are still being bred in the US. Nevertheless, these are beautiful, vibrantly colored rabbits, bright-eyed, substantial, and densely furred. Check the BRC website to locate a breed club and breeders in the UK. 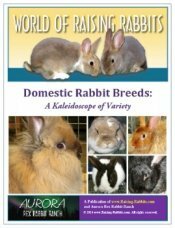 Why choose an Alaska Rabbit? The Alaska's original purpose is for its fur, helping to reduce the pressure of trapping Alaskan fox. You could also tan and utilize the fur. The breed makes a very flashy pet, with its intense and shiny black coat and dense silky fur. At 7 - 9 pounds, this rabbit can also double as a meat rabbit or a source of raw homemade pet food. Show these rabbits. (ARBA still does not recognize this breed. Maybe YOU could help change this by raising them and spurring interest in the breed.) Rabbits with such dense and lustrous coats usually tend to win more often than seems fair!